A 67-year-old man who slipped and suffered a head injury on board a pleasure cruise was evacuated by lifeboat crews on Sunday (August 20). 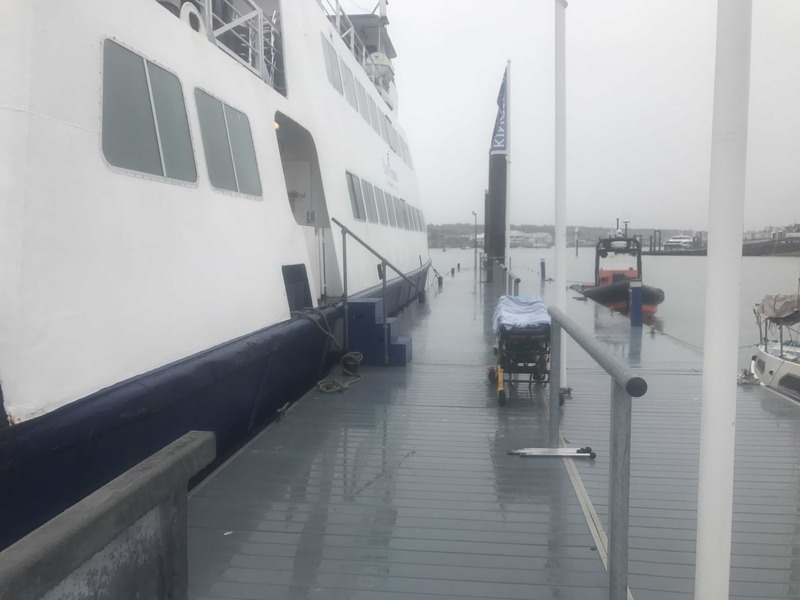 The man had fallen down a flight of stairs on the ferry and had hit his head when Gosport & Fareham Inshore Rescue Service (GAFIRS) was tasked to assist by UK Coastguard. The ferry, which had left Portsmouth and was bound for Southampton, was passing Gilkicker Point when the alarm was raised. GAFIRS Lifeboat crews were on station at the time and launched at 1620. The vessel was located in minutes and two GAFIRS crewmen were placed on board to assist the casualty. GAFIRS senior helm Brian Pack said: ‘My crew assessed the gentlemen who was complaining of head and neck pain. They administered oxygen and immobilised his neck as a precautionary measure. An ambulance crew met GAFIRS lifeboat and the ferry at Trinity Landings and the crews worked together to evacuate the casualty. He was taken to St Mary’s Hospital for further treatment. The incident was the second medical job GAFIRS Lifeboat crews attended this week. On Wednesday afternoon (August 16), the lifeboat was tasked to assist a crewman who had seriously injured his finger while mooring a motorboat in Portsmouth Harbour. Lifeboat crews administered first aid, evacuated the casualty to the lifeboat and placed him in the care of ambulance crews at Camber Dock, Old Portsmouth. The incidents were the 74th and 75th of the year for GAFIRS, and independent lifeboat station based at Stokes Bay, Gosport.